What Makes Collard Greens Less Bitter? What Is the Nutritional Value of Chex Mix? With the name of a vegetable and the crunch of a snack chip, versatile wasabi peas display characteristics of both groups and are easily incorporated into a healthy diet. 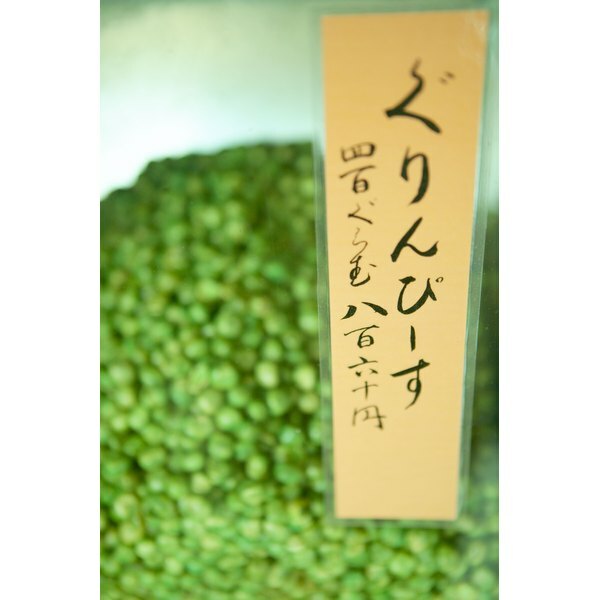 These roasted green peas coated with spicy wasabi contain few calories and even provide nutrients. More important, they may satisfy a craving for less-nutritious snacks. Substitute them for full-fat snack chips or refined-flour crackers, or add a sparse handful to spice up healthier basics. According to LIVESTRONG'S MyPlate, each 1/2-cup serving of hot, wasabi-coated roasted green peas contains 130 calories, 5 grams of protein, 1 gram of dietary fiber and no cholesterol. Not quite as nutritious as their namesake, however, wasabi peas do also contain 95 milligrams of sodium, or 3 percent of your daily allowable sodium intake, plus 4 grams of sugar and 1.5 grams of fat. To add zing to your usual trail mix, combine wasabi peas with salt-free roasted walnuts, pumpkin seeds and dried cranberries. The combination will satisfy every craving, from sweet to spicy and crunchy to chewy, while also providing protein, healthy fats, fiber and other nutrients. For a healthy snack or even a light meal, chop up a green lettuce salad -- including nutrient-rich vegetables such as tomatoes, carrots, fresh broccoli and leafy greens -- but replace your salad croutons with wasabi peas. Typical croutons often provide only refined flour, sodium and empty calories, while wasabi peas add spicy flavor and a similar crunch -- but lower-calorie nutrition in the form of protein and fiber. As a healthy mid-afternoon snack, especially on a cold day, a cup of soup can provide a wealth of nutrition and even add to your daily fluid intake. Choose mixed vegetable, chicken noodle or lycopene-rich tomato soup. If your soup comes from a can, choose a low-sodium, low-fat variety. For a topper, however, skip the refined flour of saltine crackers and instead toss a handful of wasabi peas into your steaming cup. Although the traditional childhood snack of ants on a log involves celery, peanut butter and raisins, try a spicier, grown-up version. Spread a light coating of low-fat cream cheese along the inside of a celery stick and line with a trail of wasabi pea "ants." Add sesame or sunflower seeds to the wasabi peas for taste and texture variety, as well as a boost of omega-3 or vitamin E. If you are feeling particularly adventurous, skip the cream cheese and lightly spread natural peanut butter along the celery stick and dot with wasabi peas.